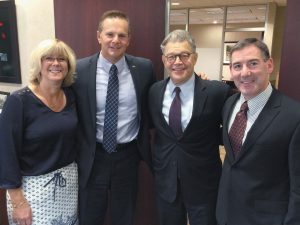 Ken Johnson (second from left) hosts Sen. Al Franken (D-Minn., second from right) during a bank visit. For Ken Johnson, president & CEO of North Shore Bank of Commerce in Duluth, Minn., success in advocacy starts with sharing stories. Johnson has been a passionate advocate for the industry for almost a decade since he was asked by Doug Lewis, the bank’s owner, to step in and fill a position on the government relations council of the Minnesota Bankers Association. (Lewis had been actively involved with the MBA for more than 25 years). Since then, Johnson has played an active role on the council (he currently serves as past chair), is a member of the MBA board of directors, and also spent three years as a member of ABA’s Community Bankers Council. As the top originator of residential mortgages in northeastern Minnesota, the $266 million community bank has a unique perspective on the effects of regulation such as the TRID or Qualified Mortgage rules. “We try to stress that many of these changes have been first and foremost a burden to the consumer—whether it’s the time they have to wait to get their money or the fact that many feel so overwhelmed by paperwork that they can’t possibly comprehend,” Johnson says. Johnson also makes a point to involve employees—particularly those in compliance and mortgage origination departments—in lawmaker visits.